This has been a big year for Arkansas doom merchants Pallbearer, with third album ‘Heartless’ receiving widespread critical acclaim, and winning Metal Hammer Golden God award for Best Underground Band. Heartless has been one of my favourite albums of 2017, and so I was delighted to find that Pallbearer more than met my high expectations with their live performance at L’Usine. There’s an innate humility to Pallbearer’s music which becomes more evident when they are onstage. They stood close together, with vocalist Brett Campbell off to one side and the central position taken by drummer Mark Lierly, who was positioned as close to the audience as the other band members. Whether it was simply to keep his drum kit out of the way of Paradise Lost’s I’m not sure, but this mutual deference and musical egalitarianism almost appeared to translate into the music itself, since there is an intrinsic kindness to Pallbearer’s sound. Brett Campbell’s beautifully poignant voice and Devin Holt’s guitar solos were definite stand-out features of this performance. Holt’s thoughtful solos are interwoven seamlessly into the songs with a quiet passion that is almost embarrassed to stand out. Pallbearer’s setlist included some of the catchier tracks from the new album, such as ‘Thorns’, as well as longer magnum opuses (‘Foreigner’, ‘Dancing In Madness’) that filled the venue with layered surges of depth. Despite the long passages with no vocals, the slow speed and rawness of tone, this is highly accessible doom. Pallbearer’s influences range from grunge to classic rock to prog, and their music possesses an inherent humanity that never allows the sound to become too bleak. Their powerful, emotional set was extremely well-received by the crowd. And speaking of accessible, let’s move to Paradise Lost. And an admission – I’m new to doom and related subgenres. For a doom virgin surely there’s no better place to start than with Paradise Lost, the gothic pioneers from Yorkshire who influenced an entire musical generation. 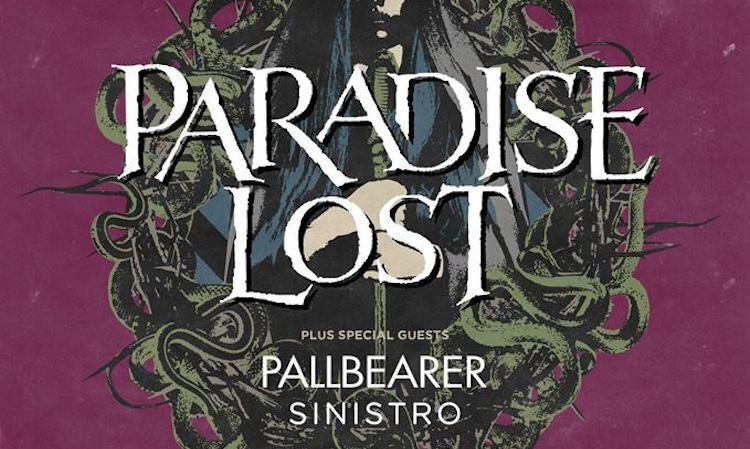 Paradise Lost are currently touring Europe with their fifteenth album, Medusa [review here], and tonight they showcased some of its best tracks, as well as a selection of crowd-pleasers from throughout their career. The set began with an ominous theatrical synthesised recording, before the band launched into ‘From The Gallows’- and I was utterly hooked throughout. Crowd energy can be a problem at L’Usine, Genevans not generally known for their metal enthusiasm or for staying out late, but thankfully the place was packed, with a distinctly more gothic feel than usual to the clientele, and a sense of reverence in the air. 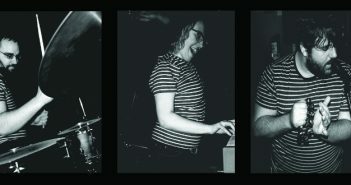 With his seasoned professionalism, vocalist Nick Holmes accomplished the feat of being dour and nihilistic while at the same time creating a warm rapport with the crowd. I was mesmerised by lead guitarist Gregor Mackintosh, sporting an interesting mohican haircut and deftly wielding his left-handed Framus V-shape. He interspersed trademark melodies with deep chugging riffs and the occasional atmospheric clean passage, and he may be my new guitar hero. 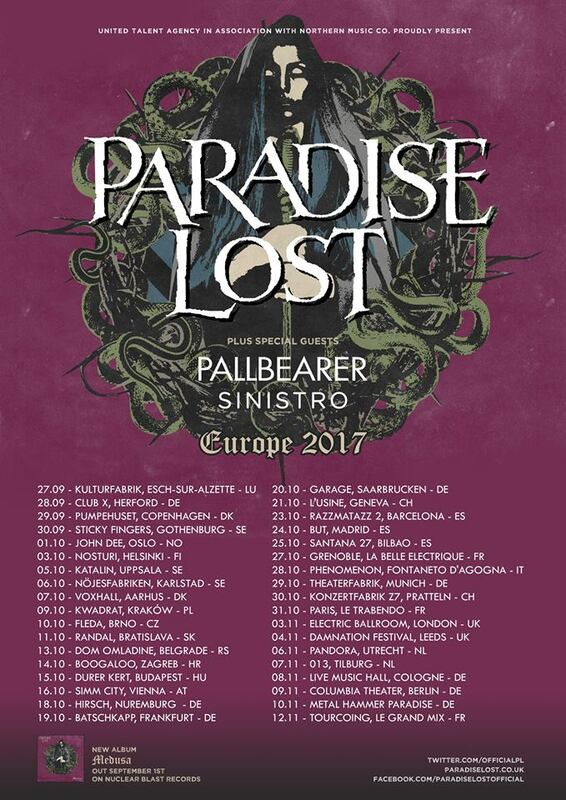 Paradise Lost have kept a remarkably consistent unit for nearly thirty years, only the drummer changing, and 22-year old newcomer Walterri Vayrynen seems to be an admirable addition to the line-up. I’m still at the stage where I don’t know Paradise Lost’s music very well, so it was fascinating to note that many of the tracks sounded familiar. This is testament to the enormous influence of this band on multiple genres of metal. It’s also testament to the ‘knowable’ quality of the hooks that they come up with; ‘Blood and Chaos’ is so ridiculously catchy that I am borderline obsessed and will no doubt hate it in a few days when I’ve played it a thousand times. The setlist included four tracks from the new album, as well as a range of favourites including ‘Tragic Idol’, ‘Erased’ and ‘Faith Divides Us – Death Unites Us’. Over the years Paradise Lost have made considerable use of keyboards, electronic effects and backing vocals, and in order to replicate this on tour they are required to use a backing track. This worked well and was of course necessary, although it would be fascinating to see them play with live synths one day. For further reading, check out our interview with Paradise Lost, and review of their latest album Medusa.